In Greek and Roman mythology, three goddesses known as the Fates, or Moirai, determined the span of individual lives. From the time of the poet Hesiod in the 8th century, the Fates were personified as old women. Clotho (whose name means “Spinner”) spun out the thread of human life; Lachesis (“Allotter”) dispensed the thread; and Atropos (“Inflexible”) cut the thread in order to determine an individual’s moment of death. This basket-flower seed captured by a strand of spider silk brought Atropos to mind, and it amused me to think of the frustration she might have experienced had she attempted to expand her powers to the natural world. Clipped by her shears and freed to drop to the ground, the seed might well have taken root, allowing life, not death, to be the result. Even the Fates, it seems, can’t control everything. Perhaps it was your fate to get this picture. 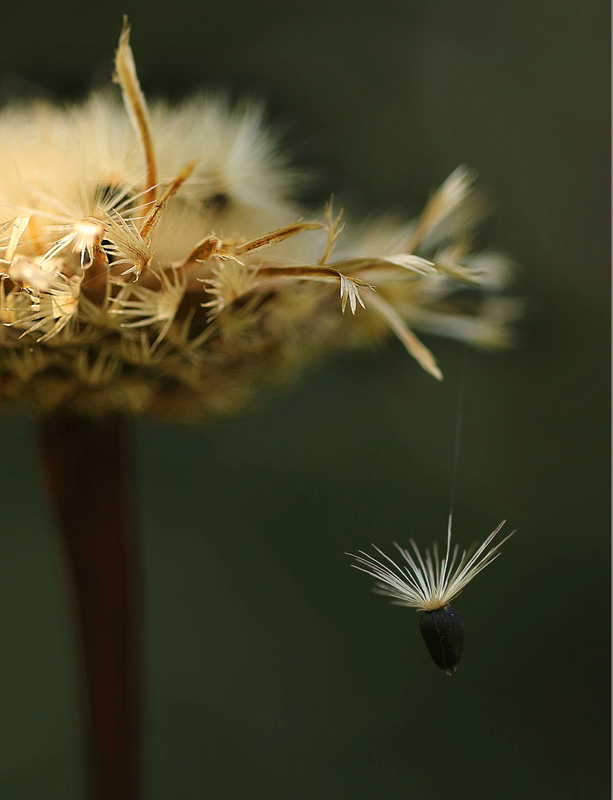 Fate aside, going to 1/1000 of a second for your shutter speed paid off in stopping the motion of the dangling seed. I was heading to the car to leave when I spotted this, and the thought of getting the macro lens, returning to the spot, and spending more time wasn’t entirely appealing. But I knew I’d regret not going back, and it worked out well enough despite the high-noon sunlight and stiff breeze. Plenty of images got trashed, but I learned a good bit. Sometimes you’re so smart and think so outside the box that it totally freaks me out because you come up with the most brilliant insights. Like this. A) You knew enough about all that to see this and think, “Oh, of course!” and B) you know how to convey the story in such an intriguing way. I know your camera isn’t quite new anymore but I still think of it as your new camera because everything I see maximizes its powers in a new way! One reason I find connections like this is my educational background. No, I don’t mean my graduate degree. I mean 9th grade Western Civilization, where we first learned about the Muses, the Moirai, Roman columns, and Greek drama from Mr. Ratcliff (who’s still alive, and ninety years old). I’m infinitely grateful to have grown up in a time when schools were dedicated to educating students — and allowing free play at recess. Your comment about my “new” camera tickled me. I still think of Princess as my new car, even though I’ve had her for six years. And there’s no question that the camera’s still new for me. Every week, I learn something new with it, whether it’s a new technique, a new setting, or just new knowledge about the inner workings of the thing. The learning process is as pleasurable as the result. I do love bringing the Fates into the picture (pi)! I have always imagined our life tapestry in the hands of the fates and whether if something happens to deviate from, well fate, that they would simply reweave a strand or two to make sure two lovers who might have missed, will meet. We humans can mess up a plan or two. Like your suspended seedling, maybe we too are cut loose for the worse or for the better? I really like the photo…macro? Yes, macro: my 100mm lens. Basket-flower seeds are about half the size of a small grain of rice, or even smaller, so this one was a perfect subject for macro shooting. Eventually, I’ll learn how to use post-processing to do things like lightening up that seed a bit. I did have several generally poor images that showed terrible chromatic aberration, and I managed to remove that with Lightroom. One step at a time. I’ve never believed that fate, or the Fates, or any other force controls and manipulates life. Serendipity, coincidence, and synchonicity seem better descriptors, but I can buy into the myths long enough to imagine a frustrated-out-of-her-mind Atropos throwing a fit at a seed that refuses to die! One of my favorite book series is Piers Anthony’s ‘Incarnations of Immortality’, a bit of a romp with some of our most sacred and treasured beliefs. My favorite is ‘On a Pale Horse’ and I think many would be less afraid of “Death” should they read it. But, I can probably trace my fondness for the Fates and the reweaving to his ‘With A Tangled Skein’, of the series. I am also a serendipity girl but love the concept anyway. I’d never heard of Piers Anthony. When I looked him up, I discovered he’s a science fiction/fantasy writer, so that explains that. I’ve dipped into the genre from time to time, but it’s not my favorite. When I read this review, I saw why With A Tangled Skein came to your mind. Anthony’s reworking of the three aged sisters was interesting; he made one young, one matronly, and one old. Of course, the age distinction would have served Anthony’s plot line, so it makes sense. The review is interesting but can’t say I found it lumpy….I completely dug the machinations and the Fates have come to mind many times when considering things like paths not taken or taken…..what role did the hand of Fate play? You might enjoy On a Pale Horse even if that is the limit of your foray into the series. I was charmed. And I thought you might have used your left hand to thump the mother to coax the seed/seeds to fall, and you kept thumping until you captured the effect with the camera! I would not have seen that wisp of spider’s silk! There’s no way I’m coordinated enough to pull off that trick, Lisa, even if I’d thought of it. Someone else shaking the seed head might have worked, but that’s a little more contrived than I like. I didn’t see the spider silk at first, either. All I saw was the seed apparently hanging in mid-air. When I realized it wasn’t going anywhere because it had become entangled, I wasn’t sure it would hang there long enough for me to get my macro lens and come back, but it stayed put and I managed to get the photo. I went back in the evening when the light was better to see what I could do, but of course it was gone. I’m learning the wisdom of Carpe Camera! This is a stunning image, Linda! And well versed in making your comparison to the fates! I was pleased to be able to capture it, Pete, although I must say I would have been happier to capture it a little sooner. It’s hard to slow down and remember how to do this or that when all you can think is, “Bring on the air conditioning!” But that’s part of the learning process, too. I’m glad you liked the Fates reference, too. I was surprised how quickly they came to mind, but they do make a nice reference. That’s a great photo of part of the cycle of life. It is part of the cycle, and in many ways just as appealing as the pretty flowers. Without the seeds, there wouldn’t be any more flowers, and the plants are efficient as can be at producing that next generation. Are we all suspended in Time at the end? Hmmm… If I could answer that one, I could write a book about it, and we could sell hundreds of thousands of copies, go on all the talk shows, get rich, and take everyone from First Wednesday on a cruise. Maybe we’re suspended in Time now. Or, maybe we’ll get suspended from Life like a recalcitrant 8th grader gets suspended from school. More thought is required! Instead of the Greek fates, maybe you need the Norse Norns here. Urd, Verδandi, and Sküld have the job of drawing water from the Well of Urðr and taking the soil around the well and pouring them on the roots of Yggdrasill, the world tree to keep its roots from rotting. That’s a great photograph. It must have been a very still day. I think I’ll stick with the Fates — at least until I learn how to pronounce those other names. One similarity I noticed is that, like the Fates, the Norns also had power over the gods as well as humans. The correspondence to the Tree of Life is interesting, too. It’s been a long time since I listened to the PP&M song that references that. I can’t tell you how happy your comment about the photo and the still day made me. In fact, it was blowing about 15-20 mph, and that seed kept swinging toward the stalk. I had to experiment with shutter speed, and finally used 1/1000 of a second to stop the motion. I wasn’t sure I’d managed it until I got home and sorted through all the out-of-focus photos to find this one. Interesting the association in European cultures of life and fate with three women. The Greeks, the Slavs, the Celts, the Norse. And the Triple Goddess (maiden, mother, crone). Oh, and that weird looking character ð is the same letter as the “thorn” character in Anglo-Saxon. I noticed the thread, and my first thought, maybe because the country fair is setting up, was actually the fairground ride called “flying scooters” or something — it has swing-seats hanging from cables in a big circle, and spins around. Sometimes they have little parachute-shaped covers, but not nearly as pretty as this seed. I don’t know if they have maple trees in Texas, but the seeds are called “double samaras” (isn’t that great?!) and when they fall from the tree, they spin down like little helicopters. I guess the Fates do allow all of us to cut loose and have a little whirl before we hit the ground! I can’t remember what we called that carnival ride, but we had them, too. In fact, they still have one over at the Kemah Boardwalk (our version of Coney Island), and they call it the Aviator. Maple trees are in short supply around here, but I grew up in a house in Iowa that had two large maples in the front yard. It was great fun to toss those seeds into the air and watch them spin down. That’s a fun video :) Guess what tune is going to be bouncing around my head today. This is one of my favourites so far! Love to see a series linking with the myths. Oh, my. Frost does sound good, even though I’m sure you might appreciate a little more warmth. I’m glad you like this. It was such an obvious connection to me as soon as I saw the thread. Why I didn’t think of Damocles and his sword, I don’t know. “Hanging by a thread” relates more to that story than to the Fates, but there’s no reason one image can’t evoke multiple myths. Enjoy your photo-taking, if you do venture out. It’s always a pleasure to see what you find. It’s all so in the balance and precarious. You went back and it was gone which gives hope it did land. The good news is that even if it didn’t land — if a bird had it for dessert, for example — the colony’s in no danger. The flowers there were so thick, and each flower filled with so many seeds, that next year’s crop is all but assured. Mirabile dictu! the mowers even have shown up, and allowed the groups of basket-flowers to stand. A certain basket-flower seed gatherer I know was delighted by that fateful turn of events. Absolutely beautiful photo. Stunning really. I like this one very much. Thanks, Yvonne. I like to think of it as evidence that there’s more than one way to gather seed. The Fates can’t seem to stop the thread getting into terrible tangles that’s for sure. A beautiful photo, Linda. But no tangles or deception here — just a straightforward little seed, hanging around to see what will happen next. I’m glad you’ve enjoyed it, too. I hope it had a fruitful journey. Do we still have politicians who read literature? Or who know these quotes? Perhaps there are a few such out there in the wide world. I know of a few, although I suspect others exist who dare not refer to poetry, literature, or any of the arts lest their constituents or opponents criticize them for elitist attitudes. Besides, when your specialty is vitriol and name-calling, what good is a well-placed quotation? What an extraordinary image, Linda, just beautiful! Thanks, Lynn. This one could be filed under “discoveries in vacant lots.” I found it on land surrounding an old power plant only a few miles from home: a nice reminder of the truth that there’s something interesting everywhere. I love that picture! and how you captured that flower or seed falling. That isn’t something that is easy to click on – I would think. That’s one reason the photo pleases me; it wasn’t easy to get. I might have had a hundred photos of the hanging seed to sort through when I started. Half I deleted right away, because they were so out of focus. Then, I tossed the ones that were too light or too dark — and so on. Eventually, I ended up with about a dozen to work with, and this was one I was wiling to publish. But my goodness — didn’t I learn a lot in the process! I’m glad you like the result, too. It gives new meaning to the phrase “just hanging around,” doesn’t it? Best visual interpretation of the Fates I’ve seen. You certainly are the renaissance scholar….a fun thing to be. Oh, gosh. I’m not sure about renaissance scholar — but I do have fun going from Point A to Point B via Points K and Q — and sometimes via 2 + 2. I’ll say this (yet again): I’m infinitely grateful for my teachers, who spent a lot of time and energy teaching us literature, geography, history — and trying to teach us math, although I didn’t do so well there. Sometimes I wonder how many high school students still study Greek drama, or could tell the difference between a Doric column and a fence post. I hope it’s more than I think. We have a rich heritage, and it’s worth preserving. I think of all the grand libraries of antiquities – knowledge must be secured and protected as much as the vintage seeds they are gathering in a secure location. Even has a major role in the plot of Game of Thrones. Have you ever read the history of the Lithuanian book smugglers? It’s fascinating and timely, and a nice read for a hot afternoon.